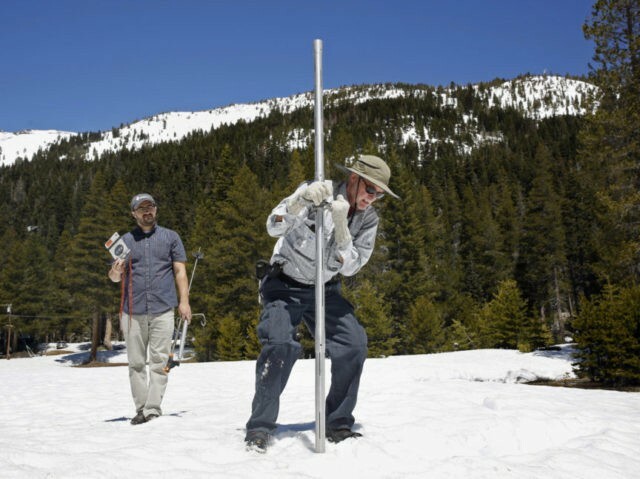 The annual measurement of the Sierra Nevada snowpack at the start of April has found that the 2017-2018 winter was technically still a dry one, despite the heavy rains and snows of March. A system lining up in the Pacific could bring in a late-season bonus of snowfall later this week, but at this point there’s little that could save this from being a dry water year. The Sierra snowpack provides about a third of California’s water supply. Last year’s abundant rain and snow left many of the state’s largest reservoirs brimming. That “carryover” should stave off another drought emergency this summer, but it means Californians will count that much more heavily on next year’s wet season. Despite the relatively dry conditions, KQED notes separately, Californians are almost back to the same levels of water usage as before the drought. Meanwhile, the Los Angeles Times reports that the Metropolitan Water District (MWD) will now pursue a scaled-down version of the state’s “WaterFix” program, with only one tunnel carrying water from north to south rather than two. Breitbart News reported recently that the MWD — which serves much of Southern California — stepped in to fund the project when other water authorities balked. It will now sell water to those other authorities — raising the water prices for its own consumers significantly, but ensuring a long-term supply of water to the region.